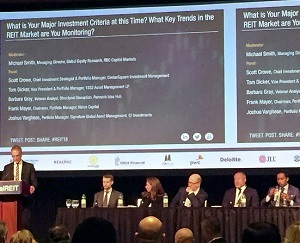 Canadian real estate investment trusts have come a long way since they emerged 25 years ago, and a group of portfolio managers discussed some of the issues affecting the trusts at the recent RealREIT conference. Vision Capital chairman and portfolio manager Frank Mayer said Canadian REITs now have combined capitalization of $100 billion and their conservative debt and asset structures have earned investor confidence. “I think the real estate market, and REITs in particular, are a fine place to be at this point in the cycle,” said CenterSquare Investment Management chief investment strategist and portfolio manager Scott Crowe, echoing Mayer’s comments. Crowe expects we’ll move closer to the end of the current real estate cycle in the next 12 months, but won’t arrive there for three or four more years. Joshua Varghese, the portfolio manager of CI Investments’ signature global asset management division, said his portfolio received excellent returns from 2010 to 2016 with special situation devalued real estate, as there were companies trading at significant discounts to net-asset value due to mismanagement. Varghese added the “blind faith” put in net-asset value has eased due to rising interest rates and increased supply, and strong REITs are separating from the weak in the current environment to set themselves up for steady growth. She expects to see the failure of more box stores and chains owned by private equity firms. Retailers will need to create experiences, where people will see and interact with a product before buying it online, she said. What makes a good REIT? When asked by moderator Michael Smith (managing director of global equity research for RBC Capital Markets) what makes a good REIT, 1832 Asset Management L.P. vice-president and portfolio manager Tom Dicker emphasized the importance of a management team which can effectively allocate capital. “It’s not the strongest that will survive, it’s the most adaptable that will survive,” he said. Varghese stressed the importance of management which is open to new ideas, listening to staff and a diversified board of directors that will keep proper checks and balances on management. Those directors also need to listen to and become engaged with shareholders in order for their interests to be accounted for. Mayer said it helps to be involved in sectors with favourable fundamentals, which is why Vision is high on apartments, industrial, storage and seniors housing at the moment. He also favours internally managed REITs. “There are always inefficiencies in the marketplace that we can take advantage of, and we’ll particularly focus on those companies that don’t have to do equity issues in order to grow, but can self-finance their growth,” said Mayer, who had concerns about investing in the retail and office sectors. “There will always be opportunities to make money in the real estate and REIT sectors. Some companies are going to be overvalued and some are going to be undervalued. Dicker said the market has probably seen peak growth in the industrial and apartment sectors. He’s still bullish on seniors housing, however. Mayer said the single most important factor in real estate demand is employment growth. The key is to focus on where demand exists and how supply is responding to those needs. Finding these areas, and taking advantage of opportunities in them, will result in strong real estate investment returns. The Canadian industrial real estate sector is benefiting from supply constraints in Toronto and Vancouver, much of which is being driven by demand from e-commerce-based companies, which has caused rents to escalate.